Karyn Ellis » Jump In – Be a Backer! 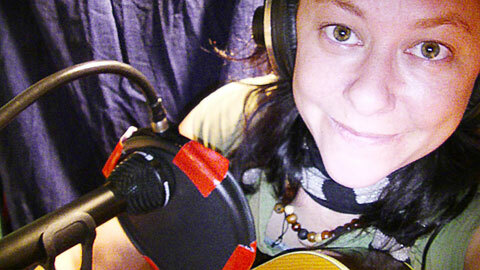 My name is Karyn Ellis, and I’m making a new record! I invite YOU to jump in and become a backer of MORE THAN A HERO. By way of introduction, here is a video I made with my friend Julie Fowler featuring me being a daredevil! What I mean is… I’m kind of scared of water, but look what I’d do to get this album made!! WE DID IT!!!! Today there was a hand-delivered cheque in my mailbox for one-hundred and seventy-one dollars… bringing us to $10,001!!! But hey, we don’t need to stop there! Everything over our goal is going right back into the project for things like publicity and making a most awesome music video so that when the album comes out, people will hear about it. Wow. What an exciting day in the crowdfunding front! Just received a cheque in the mail for a new Letterbox backer, and someone else just bumped up their contribution to become a Classic (song) sponsor. That brings us to within $170 of our goal!!!! One-hundred and seventy!!! Only 6 more C-bills away! Make that $745!! We are excitingly close! Three new backers yesterday, and we are now ONLY $805 AWAY from our goal!!! Who wants to bring this baby home? Mixes are done! Song order is picked! Album is at the mastering house! Sent the first finished mix to the mastering person today. Weeeeee!!! You folks are amazing! Less than $1700 from our goal, and we’ve almost reached ONE-HUNDRED BACKERS!!! Looking for a cool, last minute stocking stuffer? Remember to tell me who it is TO and who it is FROM! And provide an email where I can send you a digital file of the personalized gift certificate for you to print out & put in your stocking!! Hallo! Hallo! Well, I’ve been on tour in Europe these past few weeks so pretty quiet on the crowdfunding campaign front. But rest assured, the album is still well under way. And because I’m on the road, I haven’t finished liner notes yet or anything silly like that ~ lots of time left to jump in and become a backer of the new album. Oh, and I’ll be pulling out my magic markers as soon as I’m back in Toronto. Plenty of time to see your name on a hand-doodled poster ~ a thank you from me in the studio, back the album at THE SWAN level or higher. Meanwhile… more thanks to recent backers, who have come from Germany, UK, Canada, the USA… ! I have created a new Facebook event page for Jump In – Be a Backer. Now it’s even easier to share word with your friends and family about the new album!! Woo hoo! We are well over two-thirds of the way to our goal!!! And I’ve decided that if we make our goal of $10,000 by the end of this campaign, I will get the B-side version of “You’ll Do Anything” mixed, and I’ll send it to everyone who backs to the album through this campaign as an extra special thank you. I’m calling it the B-side because we recorded two different versions of the song with two different rhythmic feels while we were in the studio last month. Only one gets to appear on the final album, so if we make our campaign goal you’ll get the second version as an mp3 as well! 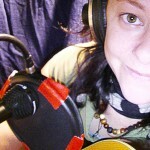 Meanwhile check out photos on my blog from recent adventures in the studio, and see where your $$ is going! Weeeee! Just added: the website WALL OF AWESOME! Featuring everyone who has backed the album to date. Give these awesome folks a hand. Oh yah! Hurray! This summer & fall I have been / will be traveling from my home in the foothills of the Cariboo Mountain in British Columbia, Canada, to Toronto Ontario to work with Don Kerr at “The Rooster”: his studio located in the west end of the city. Don & I co-produced my last album, Even Though The Sky Was Falling, and it was such a beautifully creative process that I’m glad to make the trip out east to work with him again. Don works/has worked with awesome folks like Ron Sexsmith, Dave Bidini (Bidiniband) and the Rheostatics. Don’s Website: www.donkerr.ca There’s a great photo of the studio on the homepage. The new ten-song (plus bonus track!) album, MORE THAN A HERO, captures the band magic of Brian Kobayakawa on bass, Gary Craig on drums and percussion and “Champagne James” Robertson on electric guitars (as well as a little banjitar.) All these guys appeared on my last album, and I’m so happy to be working with them again in this new configuration. I’ll be joined by the sounds of other special guests too: the occasional piano (Jeff Heisholt), cello and handclaps (Don Kerr), flugel horn (Bryden Baird), accordian (Ali Berkok) and a few vocal harmonies (Kerri Ough, Dave Bidini, Don Kerr, Sue Newberry, David Newland, David Oxley, Vincent de Tourdonnet and Evalyn Parry) here and there. Oh, and even an 11-person choir! We’ve been keeping it true to the energy of the bedtracks (that’s when the bass, drums & guitars play together “in the studio – getting the “live feel” by being recorded at the same time) adding some extra fun sounds where the songs calls for them. So you see, that’s where you come in! Now I… we… need to come up with the rest of the money I need to get the record released. I figure together we can reasonably raise $10,000. That would comfortably cover the costs of finishing the record, hiring an artist to paint the cover art, printing the first run of CDs and sending them out to press (yep, I’m still making those old things! Tangible goodies, much better for sending out to radio stations and bringing with me to shows.) If we reach the goal before the campaign deadline, wowser! Anything above and beyond the initial amount goes towards making a better launch for the record. I am my own record label — and I imagine I will once again be releasing this little cutie myself. Beyond the album itself there are costs like making posters, flyers, videos and my flights to/from Toronto. Stuff to get the record out into the world. So $10,000 will be awesome, but I’m not shy about going bigger! If you have any questions, like where we shot the intro video or if you need clarification about any of the “thank-you” items, feel free to email me at backers@karynellis.com. I will answer you in as timely a fashion as I can! Please share my intro video and the link to this page: http://www.karynellis.com/jump-in-be-a-backer/ with your friends and family. Share the news far and wide along your networks! This project is going to succeed because you make it happen. Weeeeee! And thank you very much, in advance! HEY KARYN, HOW DO I GET MY CONTRIBUTION TO YOU? *Best place to reach me while I’m in the studio! You can also send money online using electronic email transfer. See your bank for how-to details. To send money (up to the $240 level) via Paypal/credit card, click on the image that corresponds with the amount you wish to contribute. For $500 and up, please send cheque, money order or use electronic email transfer. I accept cheques in Canadian Dollars, US Dollars and Euros. I’m not going to quibble over a few pennies here and there, so use the currency exchange rate to guestimate an equivalent amount in Canadian Dollars and sent that. I’m pretty sure PAYPAL will do the exchange for you, if you go that route. Your name on my Website Wall of Awesome! A backstage pass to special behind-the-scenes and a digital copy of the title track as soon as it’s ready. A digital copy of the album as soon as it’s ready, and long before the album is released to the public. A signed copy of the CD as soon as it’s back from the manufacturing plant PLUS your name in the liner notes. A special zine I’m making especially for backers of this project. It features all my lyrics to date handwritten and decorated with doodles and pictures. A handwritten postcard penned by me during a studio lunch break to let you know how things are going in the session. I’ll write you at least six handwritten postcards from the road sometime during the next year or two telling you about my touring adventures. Me in your living room playing a concert! *Some restrictions may apply related to distance and scheduling. You may need to cover my transportation / accommodation costs separately. 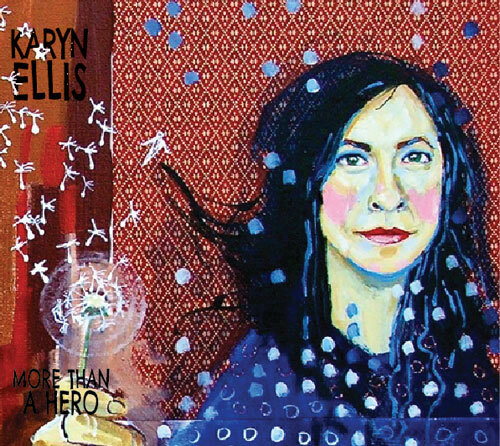 backers@karynellis.com We’ll try to work it out so that your concert coincides with existing tour plans. Alternately, we can set up a private concert for you and your friends online via Skype, or another online platform. Either way, I will bring or send up to 25 copies of the CD for you to gift to your guests/friends. A cigar. A suit. An Executive Producer credit. I am not a registered charity, so I legally can’t call your contributions “donations”. And they are not exactly “exchanges for services” either. Hmm. So let’s call them acts of patronage. Or gifts. Or financial nods of encouragement. Whatever you call them, I want you to know it makes a huge difference to me as an artist to enter the studio knowing there are a bunch of people as excited as me about getting the record finished. So thanks for your support! I’m glad you’re part of this project. Thanks for inspiring us with your AWESOMENESS and all things Karyn Ellis! Looking forward to hearing the album! Karen, I’m excited to accept the invitation to have a personal hand in supporting you in your next album. I know its going to be really great and I can’t wait to hear it! I’m inviting my facebook friends to contribute as well. This is a very exciting project and I love the way us fans are able to share in the excitement. 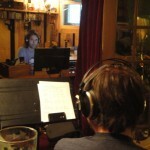 The new CD will be a real treat, looking forward to it so much. Wouldn’t you like to be a backer too? Well done! Another class act from Karyn Ellis! Sister! You absolutely ROCK and I wish you all the sweetest blessings with your new project!! We made it past the $10,000 mark!!! Let's not stop there! Everything raised above our goal is going right back into the project for things like making a most awesome music video and getting some publicity for this baby! Check out the backer levels below, along with descriptions of the thank-yous I'll send you for contributing. Any amount is awesome and will be used towards making the best record I can! Ever wanted to know what life's like on the road? Let me be your penpal and send you at least six handwritten postcards penned by me. I'll tell you about my adventures and send them to you from various cities over the next year or two of touring. Don't know where or when yet, but I'll be sure to look for the grooviest and/or most touristy postcards I can find wherever I go! That and all the other goodies mentioned below, including an additional postcard from the studio. Interested? DOWNLOAD the Backers Form. Or click on the $240 to use Paypal or Credit Card. I will send you a good ol' fashioned postcard handwritten by me during a studio lunch break giving you an update of what's been going on that day. Along with all the other goodies mentioned below. Interested? DOWNLOAD the Backers Form. Or click on the $120 to use Paypal or Credit Card. Receive an extra copy of the CD: one for you and one for a friend... both signed, of course. I will also send you a photo taken of me in the studio holding up a thank you sign with your name on it that says something like "I wouldn't be making this record without [your name]". 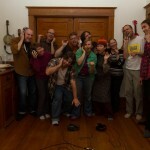 I'll send you a digital copy of the photo and post it on the website Wall of Awesome too. That along with all the other goodies mentioned below. Interested? DOWNLOAD the Backers Form. Or click on the $80 to use Paypal or Credit Card. Receive your copy of a magazine I'm making especially for backers of this project. It features my lyrics handwritten and decorated with doodles and pictures. Plus all the other goodies mentioned below. Interested? DOWNLOAD the Backers Form. Or click on the $50 to use Paypal or Credit Card. Interested? DOWNLOAD the Backers Form. Or click on the $25 to use Paypal or Credit Card. Everyone who contributes at the $10 level and higher will get a digital download of the album, long before it's available to the public. Plus your name will appear on the website Wall of Awesome! Interested? DOWNLOAD the Supporters Form. Or click on the $10 to use Paypal or Credit Card. Add your name to the Wall Of Awesome! Contribute at the $5 level and higher, and I'll also send you a download of the title track when it comes out! Interested? DOWNLOAD the Backers Form. Or click on the $5 to use Paypal or Credit Card. Any amount is fabulous! I'll send you a virtual high-five wherever you are! Interested? DOWNLOAD the Backers Form. Or click on the $1 to use Paypal or Credit Card. HELLO STRANGER! : I will buy you a suit and cigar from the Value Village and Dime Store. That's right, my friend. You gotta look sharp for all those photos I'm going to be snapping of you wearing a name tag that reads: Executive Producer. Or........ we could do this in one spectacular splash! MORE THAN A HERO: I will travel to wherever you are in the world with a bottle of Dom Perignon. We will crack it open and toast to us as we listen to the album together. I will do it, I will! Probably should email me first or I might faint! Hahaha! Feel free to email me at backers@karynellis.com to let me know it's on its way!